if you only had 60 seconds, what would you grab? 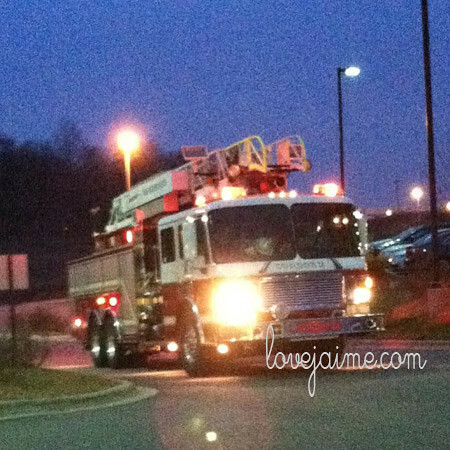 On Saturday morning, we were at a hotel in Charlotte and the fire alarm went off at 7 a.m. It was pretty surreal. I happened to be up (the baby woke at 4, and we couldn’t get him back to sleep) and had just put my shoes on to take him downstairs to entertain for a bit. My husband reacted quickly and waited on his dad to help get him downstairs. I immediately grabbed the baby, my purse (which had my phone, wallet, etc.) and the baby’s monkey lovey. Other family members were not far behind me, but I was wasting no time getting out since I had no idea what was happening. Apparently there was a major issue with one of the elevators and cables were jammed and the thing just shut down. We could smell something the previous evening, which turned out to be an electrical burning smell. I’m glad that we weren’t in the elevator when the major problems happened and that nobody was seriously hurt. Later in the morning, I was reminded of the movie Leap Year. (I’m a sucker for cheesy chick flicks.) In it, Declan asks Anna if she had 60 seconds to escape a burning building, what would she grab? Would it be the expensive items? The items you’re emotionally attached to? At the end of the movie, she was given her 60 seconds when she pulled the fire alarm and I just really loved that scene. It makes you think. If you were given 60 seconds, what would you grab? i’ve always thought i’d grab the dirty clothes hamper (how else are you going to get your clothes out quickly?) but more like i’d end up standing there for 60 seconds freaking about getting the perfect something, then walk out with whatever my hand touched on the way out the door.